The fifth SOS Children’s Village in Mexico was set up in Tijuana as the heavy migratory flows here, as well as the lack of education and professional qualifications amongst the population, lead to high levels of destitution, drug abuse and violence. Children’s lives are incredibly insecure and many are at risk of losing parental care. A little girl in Tijuana (photo: I. Hidalgo)Tijuana, in the state of Baja California, is Mexico’s northernmost city, located right on the US border, and has a population of roughly 1.3 million. The Tijuana-San Diego land border crossing is the busiest in the world, with up to 300,000 people crossing it each day. Due to the great number of migrants from southern Mexican states, and from Central and South American countries, who come to Tijuana in the hope of making their way into the US, the city is expanding rapidly. Thousands of people try to cross the border illegally, which can be very dangerous. Often, parents try to cross on their own first, leaving their children behind with relatives. They then pay a “guide” to bring their children across at a later date – which does not always work out, either because the guide is not trustworthy or because they do not succeed in crossing the border. Many of these children then attempt to cross the border by themselves. The constant migratory flux in Tijuana has led to the fragmentation, and in many cases the total disintegration, of families and a great number of children have lost parental care. These children may have to work on the streets in order to survive, thus jeopardising their education. Without protection, they are vulnerable to sexual exploitation and violence, and often they begin to take drugs. Tijuana is one of the most strategically important border towns in Mexico. The effects of the Mexican Drug War are very strongly felt here, with several rival cartels frequently fighting over regional control, leading to high murder rates, violent confrontations with police and military, and countless civilian deaths. Due to the high prevalence of violence and drug addiction, it is also common that children become the head of the family because their parents are killed, or are unable to care for them because they are addicted to drugs or in prison. These children find it hard to cope, which may lead to substance abuse, and the cycle of poverty and violence is perpetuated. SOS Children’s Villages began its work in Tijuana in 1993 because of the great need for long-term child care here due to the terrible social and economic situation and the high number of abandoned, mistreated and abused children. Today, up to 108 children from the region who are no longer able to live with their parents can find a loving home in one of the 12 SOS families here. 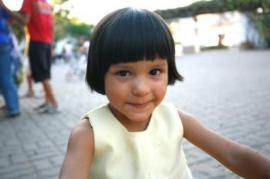 In each family, the children live with their brothers and sisters and are affectionately cared for by their SOS mother. They attend local nurseries and schools and are therefore very much integrated into the community.